We did some cleaning this past weekend; put a bunch of stuff away. In the process, we unpacked a bunch of Christmas stuff that had been set aside to go through later. The little pink ornament on the mantel? That’s a wee gift from my niece, Georgia. She was visiting with her family this past Christmas, and one of the pretty projects she was working on was painting little faerie figurines. 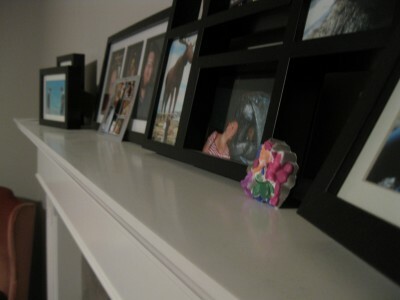 Georgie painted the figurine for me, so I figured it deserved a place of honour on our mantel with the other small family keepsakes. It’s bright enough to brighten a grey day, and we’ve had quite a few of those recently, what with all the snow. Thanks for the faerie, Georgia!